Xtreme Clean is great for steam cleaning and pressure washing; cleaning tools and implements; cleaning aircraft surfaces; removing black streaks, brake dust, grease, and oil; truck washing; removing exhaust soot; and—best of all—removing green algae off boat sides and bottoms. Removing Green Algae: From personal experience, I found it helpful to first wet down the boat and use a solution of 20 parts water to 1 part Extreme Clean. Work on one side of the boat first; you will remove about 96 percent of the green algae in the first cleaning along with any other existing dirt. After rinsing, you'll notice how bright the boat's surface will appear. For the remaining 4 percent, I found I had to use Xtreme Clean full strength with a fabric scrubber sponge to completely remove the algae. Once the algae is completely removed, rinse the boat and wipe it down with a white cotton terry cloth. 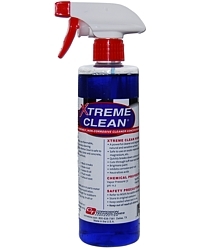 Xtreme Clean will clean your hands as well. If you have sensitive skin, consider wearing rubber gloves before starting the process of removing algae. Copyright © 11/06/10 LAF/C.R.S., Inc. All rights reserved.